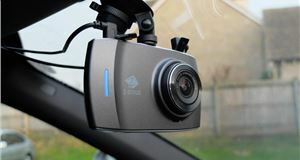 If you’re in the market for a dual-camera dash cam, so you can capture both what’s going on behind and in front of your car, there's a range of options. There are lots of off-brand budget offerings but the quality can vary wildly and spending £50 on something that doesn’t last long may not appeal. At the other end of the scale are the likes of the Nextbase Duo HD, which work well but command a recommended retail price of £199.99. 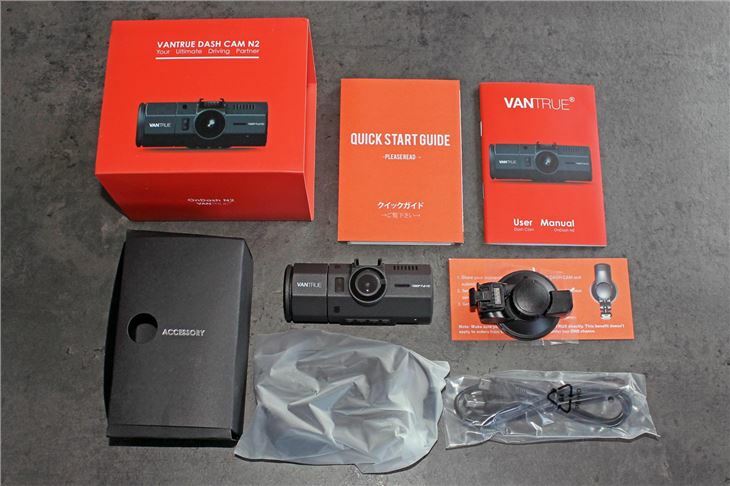 Fortunately, manufacturer Vantrue offers a dash cam that blends good quality with a sensible price. It’s not some pared-back bit of kit, either. It’s packed full of tech and, as a result, could tick myriad boxes for many buyers. The N2’s key feature is a wide-angle forward-facing camera that works in conjunction with an adjustable rear-facing camera. 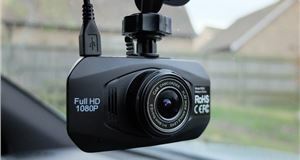 These allow it to capture a 310-degree view around the car, meaning all the evidence you need should be recorded in the case of an incident. 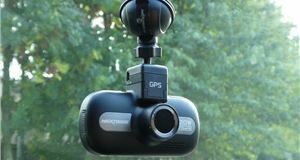 Further increasing its capabilities is a G sensor, which protects footage automatically when an incident is detected, and a ‘Parking Monitor’. 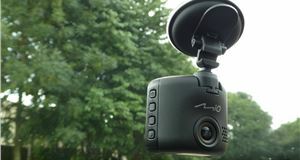 This uses the cameras’ motion-triggered capabilities to start recording if something moves near your car, which is ideal for those worried about the damage that might be incurred while parked. Like rival offerings, the Vantrue uses loop recording – so it’ll overwrite footage that isn’t required instead of simply filling up the memory card then stopping. Other highlights include a 1.5-inch TFT display, as well as a speaker and microphone. The OnDash N2 comes in a smartly presented package and, pleasingly, there’s a decent amount in the box. Besides a quick-start guide, you also get a more comprehensive printed manual, the mount, a 12V in-car adaptor and a USB cable for file retrieval and charging. The unit itself has a subtle satin finish and is well built, with an excellent rotating assembly for the rear-view camera. 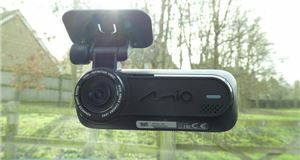 Similarly, the mount is a compact and stout sucker set-up, which affixes to the unit and windscreen alike with ease. The OnDash N2 is quite large, compared to single-camera units, but it’s not so bulky as to be hard to place in an unobtrusive spot, while its finish means it doesn’t stand out. 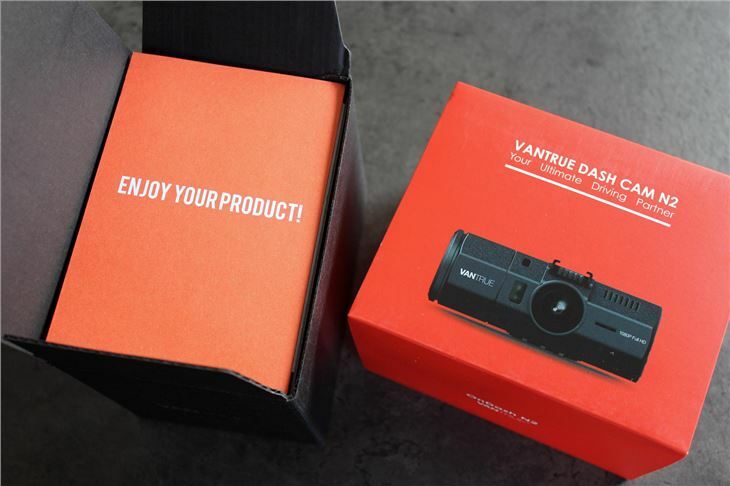 It’s also evident that Vantrue has put a lot of thought into this product. 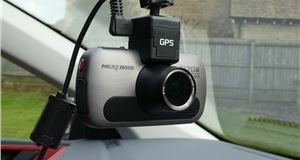 The 12V power adaptor, for example, has a cover that rotates to expose a USB charging port; this allows you to power other devices when the dash cam’s plugged into the 12V socket. The mount also contains a power connection, so if you want to hardwire the camera then you won’t have to drape a cable down to it. Using the OnDash N2 is a straightforward affair. The menus are easy to understand and navigate, while all of the unit’s controls are clearly marked and have a positive action. Even if you don’t have the manual to hand, it’s likely that you’ll quickly get used to the Vantrue. Like most dash cams, the OnDash N2 begins recording when you start your car. 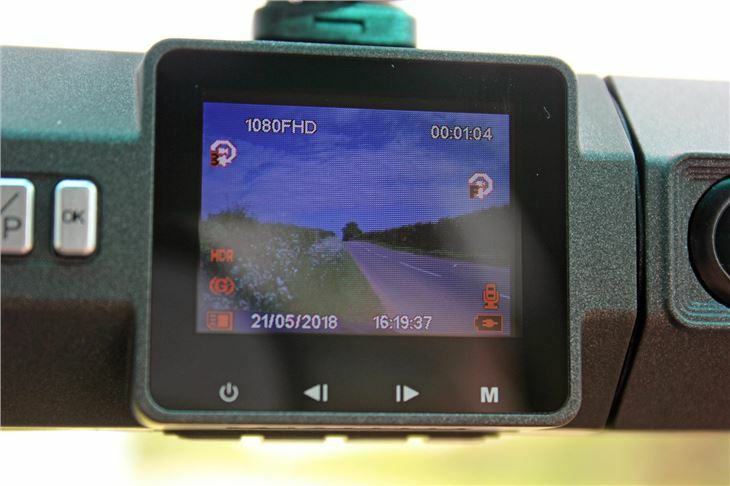 Footage captured by the camera is vivid and adequately sharp, with key features such as signs and number plates being easy to inspect when close up. Its performance in dark conditions is also very good. Max resolution is 1920x1080 (1080p Full HD). In dual-camera mode, the resolution is reduced but, even so, in this configuration both cameras produce suitably clear, vibrant footage. That said, the rear-view camera can sometimes overexpose what’s outside the car – but not to the extent that the clip is rendered unusable. Another strong point is the microphone. 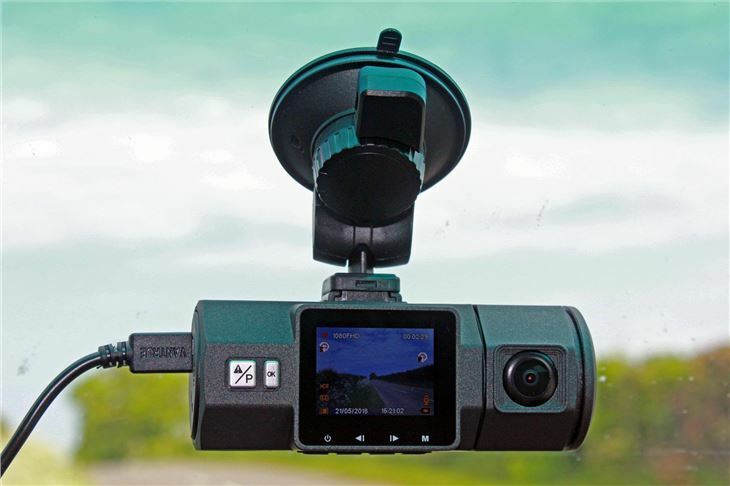 Audio recorded by inexpensive dash cams is usually overly quiet or marred by interference or unwanted noise. Sound captured by the OnDash N2, however, is clear and of a good volume. Those looking to capture speech, such as driving instructors, will appreciate this capability. You don’t get a MicroSD card with the OnDash N2, though, but these aren’t expensive and the unit accepted the 32GB SanDisk Ultra – a Class 10 card – we use for testing with no issues. 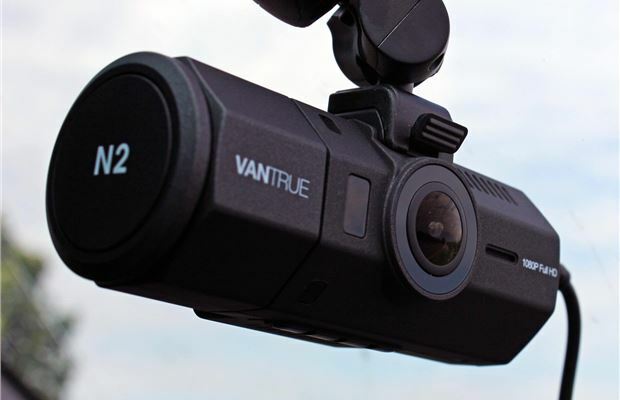 The Vantrue OnDash N2 is a capable, straightforward and feature-packed dash cam that offers plenty of functionality for a sensible price. As a result, if you’re looking for an affordable and serviceable dual-camera unit, the OnDash N2 should be on your list. Vantrue, a brand that originates from China, also has a good reputation for support and service. Consequently, even though it might not be a name that springs to mind, you shouldn’t have trouble getting help with any issues that might arise.